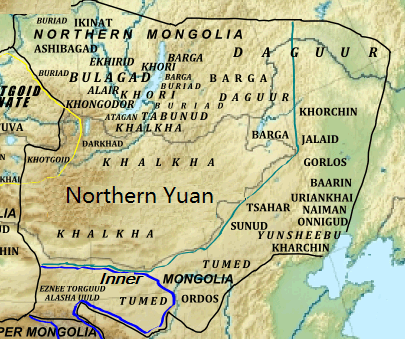 Inner Mongolia and Outer Mongolia within the Qing dynasty. Jade dragon of the Hongshan culture (4700BC-2900BC) found in Ongniud, Chifeng. Honorary tomb of Wang Zhaojun (born c. 50BC) in Hohhot. Fresco in the Liao Dynasty (907-1125) tomb at Baoshan, Ar Horqin. Khitan people cooking. Fresco in the Liao Dynasty (907-1125) tomb at Aohan. Remains of the city Khara-Khoto built in 1032. 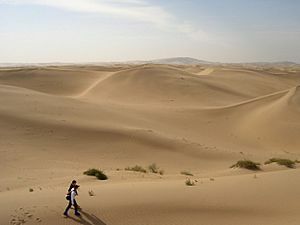 Located in Ejin Khoshuu, Alxa Aimag. Maidari Juu temple fortress (美岱召, Meidai Zhao) built by Altan Khan in 1575 near Baotou. Newly built arch in front of the Maidari Juu temple fortress (1575). Da Zhao temple (also called Ikh Zuu) built by Altan Khan in 1579. Wudang Zhao temple (1749) near Baotou, Inner Mongolia. Called Badgar Zuu in Mongolian. Badain Jaran temple (1868) in western Inner Mongolia. Alxa Western Monastery (Alshaa Baruun Hiid) built in 1756. 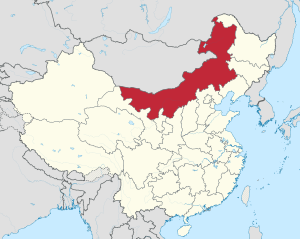 Inner Mongolia Facts for Kids. Kiddle Encyclopedia.